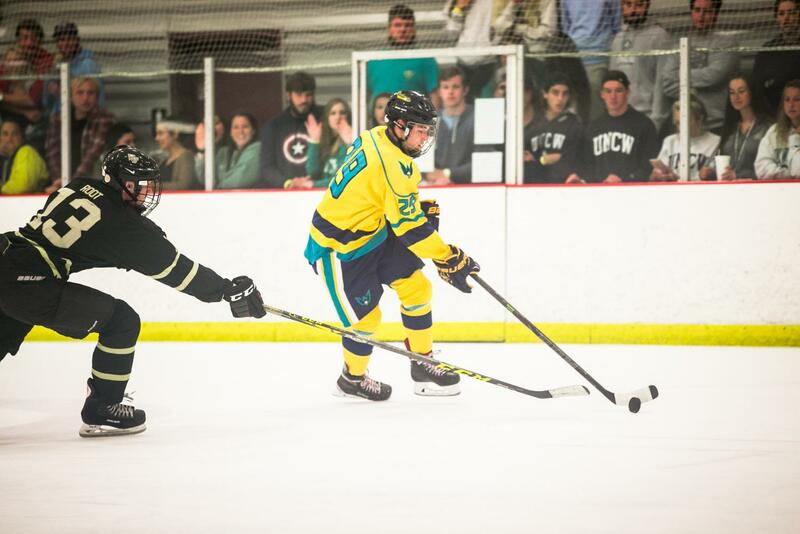 CHARLOTTE– Following a last-second victory against Coastal Carolina last Saturday, thanks to a Greg Wiklund power play goal, UNC Wilmington club hockey will hit the ice this Saturday against UNC Charlotte to play their penultimate game of the season. The ‘Icehawks’ come into this game with a 3-10-3 record on the season. Coming into this weekend, UNCC is currently ninth in the Atlantic Coast Collegiate Hockey League playoff standings, with the top eight teams in the league making the playoffs. In a losing season for UNCW, it can play spoiler this Saturday and keep UNCC out of a playoff spot. Once again, Alexander leads UNCW in scoring which is the same thing he accomplished last season as a freshman. Being such a key player on this team, Alexander feels like the team continues to get better despite the results on the scoreboard but does feel like the team isn’t playing a full 60 minutes. UNCC comes into this weekend with a 10-7-2 record following a tie against Wake Forest and a 5-1 loss to North Carolina State last weekend. UNCC is a team that is used to having success considering they are the defending ACCHL champions, after defeating Wake Forest in the tournament final last season. A win on Saturday would mean a lot to the UNCW program according to head coach Matt Huestis. Keep an eye out for UNCC’s Andrew Miller, who comes into this game with 44 points (28 goals and 16 assists) in 19 games played. In a season where the Seahawks haven’t been able to string together much consistency from game to game, UNCW will try and change that and start their first winning streak of the season on Saturday. One of the main things that impressed Huestis most about the win on Saturday was how well the team skated. This being despite the fact that UNCW played the night before against College of Charleston and arrived back into Wilmington around 5 a.m.
Huestis added that since moving forwards Will Tooke and Hunter Phillips to defenseman (which is a decision the team made a few weeks ago), the team has a much easier ability to break the puck out of their zone. Alexander also being moved to center to play with both Greg and Tim Wiklund, has provided even more opportunities for Alexander according to Huestis, when it comes to things like getting pucks in space and having the opportunity to be the playmaker that he can be. The game on Saturday will be played at the Extreme Ice Center in Indian Trail at 2:30 p.m. A live stream for the game may be provided under the Charlotte HockeyYouTube channel.